What is as well heartening to see is that some people went farther – enter Usahidi – which I have just in the last year found out about. What is Usahidi — well — it allows those being effected by the violence to both SMS/text message and/or post on a the Usahidi website all the incidences happening in regards to the violence. This gives people a “real time” map of what is happening. Having done mapping extensively with a range of groups from Vancouver to Nairobi to Dar es Salaam, being able to map real time is a huge leap forward in the ability to use information. Often data is stuck in the pipeline, waiting for users to upload it in Arcview, google earth, or some other program. Usahidi has now gone global, with it being utilized in Haiti, the oil spill in the Gulf (done by a great group – the Louisiana Bucket Brigade) and the floods in Pakistan. The amazing thing is how fast this platform is deployed and utilized. Erik Hersman, one of the founders of Ushahidi, suggests that a digitally connected world not only grants us a front row seat to the rest of the world, but also the power to influence events and create change in a way that was impossible just a few short decades ago. So that events that may occur thousands of miles away are in fact – quite literally – in our digital backyard. Which makes it a lot harder to just sit back and watch. Read his blog post below. Protesters gathered in groups and attempted to walk into the town centre; police fired live shots and tear gas canisters to disperse them. Three protesters were seriously injured and one shot dead. Police battled youths who set fire to roadblocks; the police shot indiscriminately, “targeting anyone on sight”; one man was shot in the stomach as he stood in front of his house. A 13-year old boy was laid to rest next to his uncle´s house; the burial was attended by hundreds of residents who wailed and lit up bonfires. Most likely, you didn’t hear or see these stories, except in perhaps an aggregate way: they all happened in Kenya, a result of the post-election violence which engulfed the country. In situations such as these, the major media outlets give the world a “big picture” view of the crisis: violence, rioting, bloodshed, deaths. But the individual events, the microcosmic acts of violence, go largely unreported. They aren’t, however, unseen. In the days following the Kenyan crisis, a group of Kenyan bloggers from both inside and outside of the country got together and created a website to map the spread of violence. 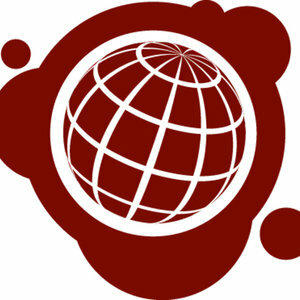 The site, called Ushahidi, allows users to report incidents of violence (as well as peace efforts) via the web or SMS. 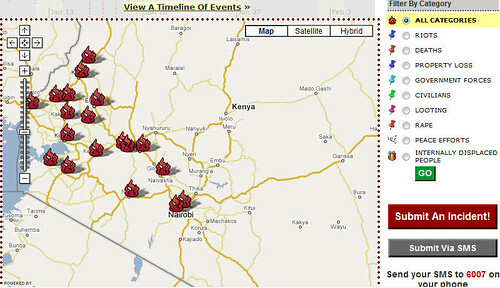 Incidents are verified and then uploaded to Ushahidi’s site and displayed on a geo-tagged map. The site also features a tool that allows for a “timeline” view of events (see below). The value of the site isn’t in its archival capabilities; as Global Voice’s Ethan Zuckerman wrote in this post, the importance of Ushahidi is helping people visualize the spread of violence in real time. Why is this important? With all of the famines, wars, floods and other crises in the world today, what good will visualizing the chaos in Kenya do? Friend and fellow blogger Erik Hersman, one of the founders of Ushahidi, answers this question in the most eloquent way I’ve seen yet. In this post he suggests that a digitally connected world not only grants us a front row seat to the rest of the world, but also the power to influence events and create change in a way that was impossible just a few short decades ago. So that events that may occur thousands of miles away are in fact – quite literally – in our digital backyard. Which makes it a lot harder to just sit back and watch. Ushahidi is a potent example of the power of what I (and many others) call “collaborative cartography.” Rather than simply create user-generated maps of local wifi hotspots or cool coffee shops, however, maps like Ushahidi have the potential to effect change. As part of its annual conference, Netsquared is hosting a competition to identify the best mapping mashups geared toward accelerating social change. Ushahidi is in the running, as are others like the Rosetta Project. Voting is open to the public until the end of the day Friday; the top twenty will receive a share of $100k in prize money to further develop their sites. You can support projects like Ushahidi by voting here.